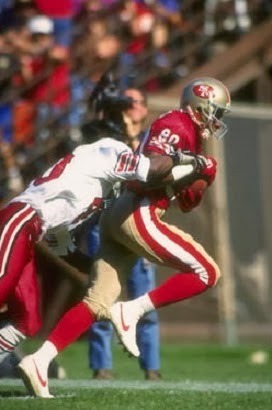 Drafted by the 49ers in the first round in 1985, Rice moved into the starting lineup as a rookie and showed flashes of future greatness as he caught 49 passes for 927 yards and diverted coverage from veteran WR Dwight Clark. In ’86, Rice broke out with 86 receptions and led the NFL in receiving yards (1570) and TD catches (15). He was a consensus first-team All-Pro selection and was chosen for the Pro Bowl. It was the first of seven straight seasons prior to ’93 in which he received first-team All-Pro honors, and he was picked for the Pro Bowl every year during that stretch as well. In the strike-interrupted 1987 season Rice had a record 22 touchdown receptions in just 12 games and received MVP recognition. In 1989, he led the NFL in pass receiving yards (1483) and TD catches (17) and in ’90 led in pass receptions (100) as well as receiving yards (1502) and TD catches (14). He had more than 80 catches, a thousand yards, and was in double figures in TD receptions in 1991 and ’92. 49ers went 10-6 to finish first in the NFC West while leading the NFL in total yards (6435), scoring (473 points), and touchdowns (61) and the NFC in passing yards (4353). Won NFC Divisional playoff over New York Giants (44-3). Lost NFC Championship to Dallas Cowboys (27-17). Rice continued on to play 20 seasons in the NFL (he missed most of 1997 due to injury) and re-wrote the record book by the time he was done. The 1986 and ’87 seasons were the first of 11 straight thousand-yard receiving seasons and 14 overall. He led the league in that category five more times, including a record 1848 in 1995. Rice also had four 100-catch seasons and was the NFL leader twice. A prolific scorer, he had a total of nine years in which he reached double figures in receiving TDs and paced the league six times. After 16 years with San Francisco, Rice moved on to the Raiders for three full seasons plus part of his last year, in 2004, in which he finished up with Seattle. Overall, he retired as career leader in pass receptions (1549), receiving yards (22,895), receiving touchdowns (197), and total TDs (208). He gained the most total yards (23,546) of any player in NFL history. The 49ers retired Rice’s #80 and he was inducted into the Pro Football Hall of Fame, Class of 2010.